Today we have a two-in-one WWE review with Kofi Kingston and his tag team partner, Evan Bourne! Okay, so they aren't a tag team anymore, but Mattel's doing there best to get up-to-date action figures out there and it's a lot harder with the Elite line. Anyway, today's review focuses on the high-flyin' team known as "Air Boom" from the pinnacle of their union when they held the WWE Tag Titles. We've seen both Superstars in the Elite line (especially Kofi), but don't write their latest release off just yet, because there's a lot of great changes on them. Let's see what they've got! This is the second Kofi figure I pick up and his fourth appearance in the Elite Collection line, but this is my first Evan Bourne figure so we'll start with him. Bourne hails from series 15 and was the first half of Air Boom that was available. This is Bourne's second Elite figure, the first one was the sole series 8 figure I didn't purchase, but I think I would have been happier with this one anyway. The sculpt, as far as I can tell from photos, is identical to the previous release. Bourne has a few pieces that are specific to him: his head (obviously), his lower torso (crotch) and his boots. The headsculpt isn't great, I suspect the goofy facial expression throws it off even more, but it's passable on the more "action-figurey" side of the line. The lower torso features a sculpted belt with belt loops and all. The most distinct sculpting bit on Bourne are his boots. The have padded shin guards that extend into a point over his knees. They hinder his boot swivels a bit, so rotating the lower legs can be tougher than on other figures. The paintwork on Evan Bourne is mostly really well done, but it's a bit sloppy on the boots. They tried to slather on the white paint and you can see some brushstrokes. He may have needed a second coat, but I guess they can't wait for the paint to dry at the factory. All the tampos are flawless on my figure; you can clearly make out all the lettering on his biceps and hips and all the logos on his thighs. The second half of team Air Boom comes to us from series 17, which already featured some cool figures, but also proves that Mattel is still investing in the Elite Collection. Kofi is one of two figures in that wave that has received some much-needed retooling. His new head is a much better approximation than the previous figures, but it's below the neck where the biggest changes exist. You may remember in my review for KK's series 9 figure that I criticized Mattel's choice in torso for Kingston. Well, the design team apparently felt it was time to freshen up Kofi's design and they've done a great job with the new torso. It's much more accurate to Kingston's body type and goes a long way in improving the figure. He's also sporting bigger arms! Looking over my collection I can't immediately place where they're from, leading me to believe they're brand-new. That may not have been necessary, but they look good on Kofi and new tooling is always welcomed! I failed to notice it right away (actually, at all, until I read this discussion on the figure), but Kofi's attire is an homage to Mattel's Battle Cat from the Masters of the Universe franchise! The paint on my figure is a little sloppy, though. The worst parts are on the orange "spring" on his right shin and the mouth of the Kofi head on his left knee pad. Also the tail-end of the spring on his left knee pad doesn't quite line up with the design on his lower leg. That may be a common factory error because I've noticed it on other figures I've seen. There was also a few stray orange marks on the back of his right boot, which is annoying to find on a near-$20 figure. Each figure includes a WWE Tag Team championship title belt, debuting in the Elite line with Evan Bourne's figure. These are vac-metal versions of the belts previously released in a basic "Battle Pack" with (I think) Heath Slater & Justin Gabriel, but has since appeared in several of the two-packs. The belts are identical save for Kofi's being darker than Bourne's. I have to say the darker version is more accurate, but I prefer the lighter one. Kofi's had some chipping on the center medallion straight out of the package, so I'm glad I picked up a loose EB-version to have matching titles. 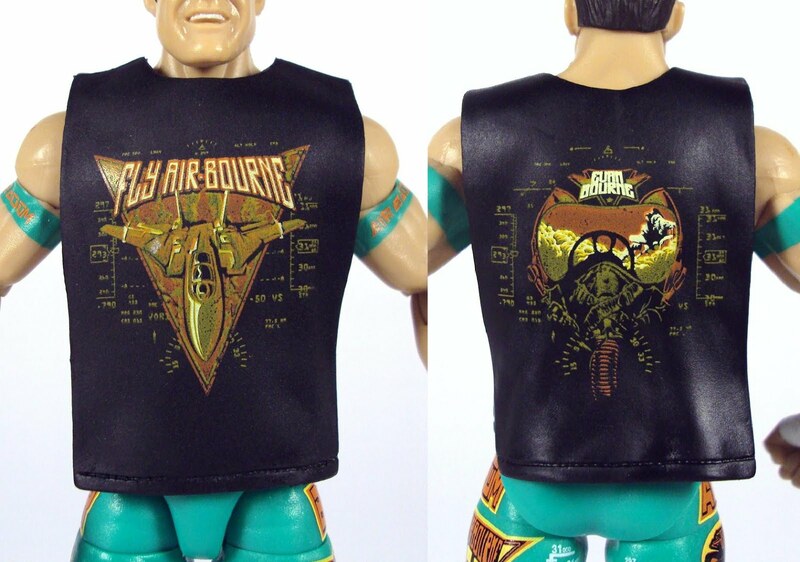 Evan Bourne beats Kofi in the accessory department because he also comes with his cut-off entrance t-shirt. It's molded in soft, black plastic and has his logos printed on the back and the front. The tampos on the shirt, just like those on the legs, are well-done and sharp. I know it's costlier to have cloth accessories, but in Bourne's case you have to appreciate the molded t-shirt a lot more. It's much more durable than cloth and they're able to apply more paint to it. I also like the fact that it's thin enough to tuck under the title belt while he wears it. I still see Evan Bourne figures at a couple of stores in my area, so you shouldn't have a tough time hunting one down. I can't speak for his previous release, but this one is solid, minus the weak white paint on his boots. Kofi is two waves newer than EB, but I've only seen him twice in-stores and the TRUs in my area are already stocking series 18. Kofi suffers from some minor paint issues and a bit of carelessness in the form of the random slop on his leg, but he turned out really well. The fact Mattel is willing to go back and improve the sculpt on an already established figure makes me optimistic for the future of the line, which admittedly wasn't doing all that bad to begin with. I sold off my E8 Kofi without hesitation because he just didn't seem like a great representation of the Superstar. That was before I knew this figure would be retooled, but even if I had kept it, this feels like a completely new figure and totally worth the purchase.